Lady Goats: Operation Organize Garage: Why is this TAKING so long?! Operation Organize Garage: Why is this TAKING so long?! When I started organizing my garage, I had NOOOOO idea it would take forever. Or over a month. Really, I didn't feel like making a huge project out of it, so I made a short to-do list. That doesn't look so bad, right? My favorite part is checking things off, and unfortunately I don't get to check anything off in this post. Rather, I added something. I also want to share what the plans are for the rest of the "stuff" so that it doesn't seem like I'm in over my head (because I was kinds feelin' like that for a while!). We have four bikes that we need to store. Two of them need to be easily accessible at all times while the other two will only get occasional use. 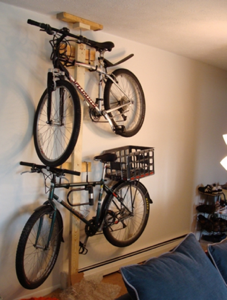 I plan to do something similar to this for all four bikes (in two locations, so I'll have to build two racks). Will share how I modify the idea into a permanent solution, of course. 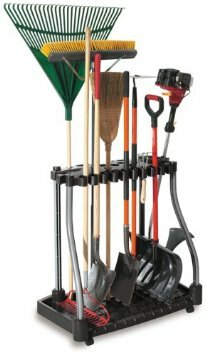 We have more shovels and rakes than I feel is necessary, buuut we're not getting rid of any of them (trust me, I tried... Mr. Goats wouldn't have it). I plan to use the image above for a jumping-off point in creating my own DIY tool rack. I may incorporate some ideas from this as well. Click here to check it out... And "like" me while you're there. How's your garage lookin' these days? I've been going through the same thing, except it was my laundry room taking forever! 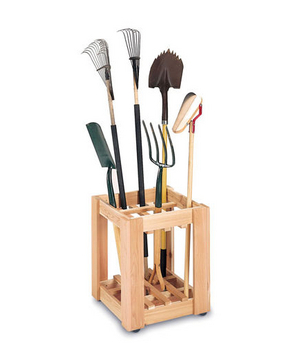 I love these garage posts because that is one of the things on my spring to do list. Excited to see your mudroom area! Unregulated warmth from the radiator may end up noticeably destructive to the chemicals and different things put away inside the carport. Nice! You got a very amazing organized garage. Nice photos as well.